One of the most dramatic (and dumbest) conspiracy theories of all time is the Phantom Time Hypothesis, put forward by the conspiracy theorist Heriber Illig. 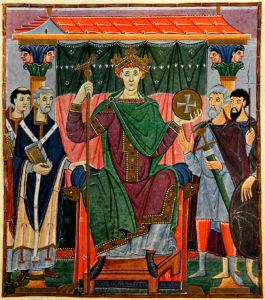 They hypothesis states that almost three centurires of the Middle Ages, AD 614 to 911, never happened, and it was all because of Otto III (pictured below) and Pope Sylvester II. Like the legend of Polybius, though, this is a conspiracy theory with some fascinating truth behind it. There are indeed chunks of missing time in the calendar, a result of the switch from the Julian to the Gregorian systems. Easter jumps around. Sure, it’s always on a Sunday, but unlike, say, the U.S.’s Labor Day (which always falls on the first Monday in September) Easter jumps around. It could be on the third Sunday in March. Or the fifth. Or the fourth. Or sometime in April. It jumps around. The dating of Easter comes from a combination of lunar and solar calendars, astronomical events, and religious tradition all crashing together. The result is that Easter is sometime in March. Or April. It’s complicated. To help shed some light on when Easter is actually supposed to happen, we sat down with Jamie Jeffers, the man behind the excellent British History Podcast. Jeffers has previously gotten into some of the controversies surrounding Easter on his own show, and has detailed how fights over the holiday led to actual, real violence among early Christians. Also, there were some very bad haircuts involved. Again: It was complicated. 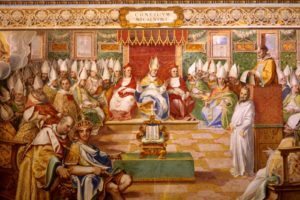 Pictured below: The Council of Nicea, which tried (tried) to sort this all out. They only kind of did. Happy New Year! It’s January First, 2015, and you probably have a new calendar. Calendars tend to be irregular, weird, and uneven, but some folks have attempted to smooth that out throughout history. Below is the Soviet Calendar. Workers were assigned colors, and based on the color assigned to you, that would be your day off. Convert Gregorian dates into French Republican dates here. The current time and date according to the Hanke-Henry Permanent Calendar. Scientific American on the Hanke-Henry Permanent Calendar. An overview of the Symmetry454 Calendar.